Can a Felon Become an Auto Mechanic? 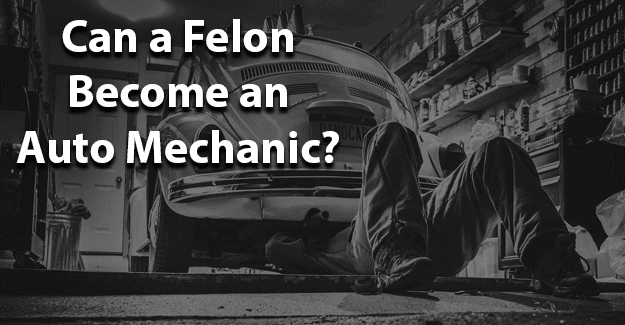 This blog post will address the issue of whether a felon can become an auto mechanic. What Education/Training Does an Auto Mechanic Need? An auto mechanic is a person who ensures that a vehicle operates in a safe and reliable manner. They are responsible for diagnosing and repairing problems with cars. An auto mechanic also performs preventive maintenance such as brake and fluid checks, oil changes, and tire rotation to make certain a car operates as efficiently as possible. Current technology requires that a mechanic be familiar with electrical and computer systems of vehicles. A mechanic can be considered to be an auto technician. An auto mechanic must be familiar with diagnostic computer equipment to discover a problem, explain it to a customer, and be prepared to fix that problem. They may work in a variety of settings including a repair shop, dealership, gas station, rental car companies, and private car shops. Most auto mechanics work a 40-hour week but often put in more time with many repair shops being open evenings and weekends. Typically, to become an auto mechanic, an individual needs a high school diploma or a GED. There are many programs available through a community college or technical school offering the necessary basics to find a job as a mechanic. While it is possible to work as an auto mechanic without any certification, many employers in this area prefer hiring someone with a certificate or diploma from an accredited school. The most recognized certification is through the National Institute for Automotive Service Excellence (ASE). Programs offering this combine technical and hands-on training. Most programs include an internship for gaining practical experience. Typical length of an auto mechanic program is six months for more basic training to two years for an ASE certification. There are certification exams to take and pass for ASE. The U.S. Bureau of Labor Statistics indicates that there are approximately 740,000 auto mechanics. This occupation is expected to show a 5% growth by 2024. The average salary for an auto mechanic in 2015 was $40,700 annually. The top 10% of mechanics earned $63,000. Geographic location, certification, experience, and specialization could have a significant impact on these earnings. Auto mechanics on the East and West coast tend to earn a higher salary. While each technical school and training program has its own criteria, there is enough demand for qualified mechanics that many programs will accept a felon. With the opportunity to specialize in different types of engines, from small to large to diesel jobs are available. A good avenue for a felon wanting to become an auto mechanic is to find a job as a mechanic helper to start. Then they can gain experience and demonstrate how far they have come in a positive direction since their conviction. After a couple of years’ experience, it will be more likely that they will be accepted into an auto mechanic program. In order to be successful in their pursuit of becoming an auto mechanic, it is essential for felons to be honest about their background. Lying about their conviction will prevent them from becoming an auto mechanic. It is important to be honest in filling out an application for certification. If a felony isn’t disclosed but found on doing a background check, this constitutes fraud and is a punishable crime. In order to be successful in this pursuit, it is essential for felons to be honest about their background. Lying about their conviction will prevent them from becoming an auto mechanic. Having their felony expunged can give them the chance they need to begin with a clean record and succeed in becoming an auto mechanic. For families of felons wanting to pursue a dream of becoming an auto mechanic, encourage your loved one and support their efforts to live an honest life, change their lifestyle, and keep their dreams alive. What do you think about this blog post? Are you or someone you know been in the situation of trying to become an auto mechanic with a felony? What was that like for them, and how did they achieve success? Please tell us in the comments below.